The wake-up light should increase light intensity automatically from zero to full during a configurable period (for instance, starting at 6:30am ending up with full intensity at 7:00am). 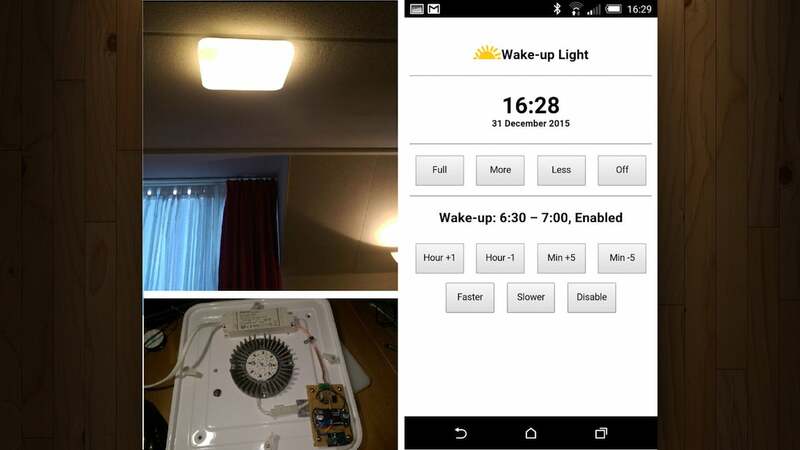 Normal functionality of the ceiling light (switching it on and off with the wall switch) must be retained; the wake-up functionality should just be an add-on to that. I wanted the solution to be integrated in the lamp; no additional visible boxes or cables. The solution must be stand-alone in the sense that it doesn't rely on any already deployed domotics system (for the simple reason that I don't have one). The final result is a switch-operated light that connects to the internet, uses Network Time Protocol (NTP) to keep track of itself and has a rolled-in simple webapp he can pull up from his phone to tweak the lamp's settings. You might think it's based on an Arduino or a Raspberry Pi, but he actually built the board himself from some affordable components you can buy. Check the link below for the full list of parts, the circuit diagram, and all the code you'll need to put the pieces together. It's a great project whether you're a newbie at electronics projects or a practised hand.